In order not to give any spoilers I’ll just stick to general terms. I enjoyed that the comic book starts with Justice League and some humorous exchanges between it’s members. The general idea of the villain in this comic book, that is mentioned on the back-cover, Hordr, is interesting – they try to find out the biggest secret of the person and control them using it – usual blackmail? But it seems more to be at the line of surveillance and security issues and instead of just releasing a secret (or secret documents for that matter) to the public Hordr uses it for it’s profit. I didn’t really like the part that Lois Lane played in the book. This was my first Batman comic book I’ve read. And overall second comic book ever. Hooray for starting with some nerdy education! I liked the story – it was quite mysterious and made me suspect totally innocent people in the comic book (but, hey, if the Batman movies are any indication, you have to watch out and not trust just about anyone in Gotham city). In this comic book, there is a man found, murdered with a secret message hidden on the wall “Bruce Wayne will die tomorrow”, which naturally doesn’t sit too well with Batman. 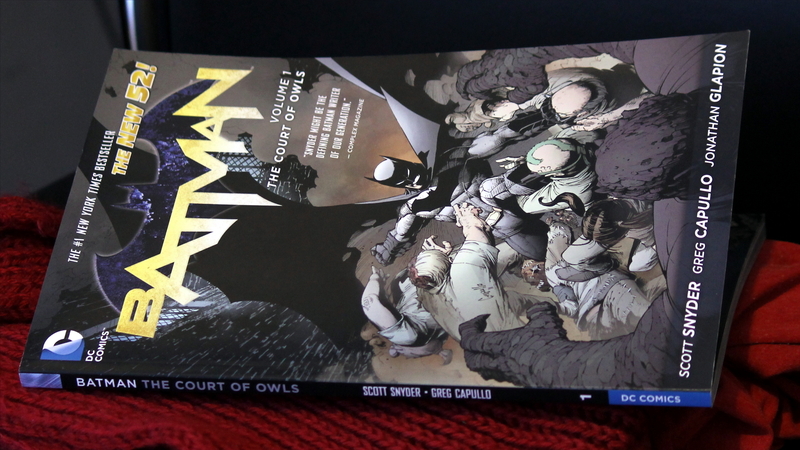 And then there are different signs and places were the imagery of owls creep up, and Batman is about to try and find out whether there ever has been and maybe still exists such a thing as the Court of Owls. What it’s all about you can read yourself. It was cool, and the end definitely makes me want to find out what happens next. I’ve never really given much thought to why I didn’t read comic books, probably because they never got in my way, and in general I tend to want the books I read (or at least buy) to have a lot of words and pictures aren’t really important. I liked the fancy technology though, and the quite imaginative (although not too realistic occasionally) science. So in general I found it a pleasant reading experience, albeit a short one.